Is it a case of second chances? Or will history repeat itself? Six years ago, Adam broke Scott’s heart, but now he’s back in Scott’s life and Scott is rightly suspicious. 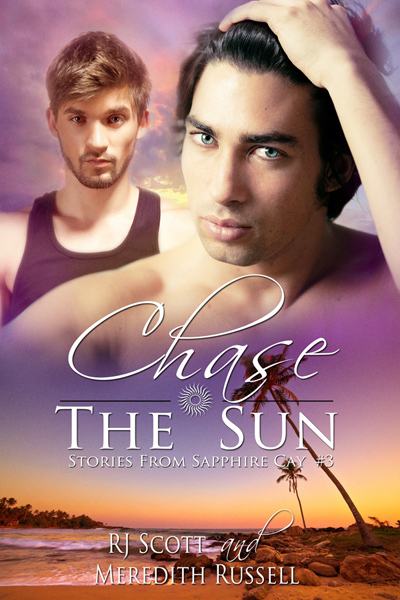 In Chase the Sun, Scott Antonelli is about to get the shock of his life. Six years ago, Adam Ross broke his heart and it was the trigger that set Scott off travelling around the world. For the last few years he has worked at Sapphire Cay with Dylan. On a simple supply run to Marsh Harbour, he is left reeling, as he comes face to face with his first love. Can he trust Adam this time round? Adam Ross was an idiot. Looking for quick and easy cash, he got himself mixed up in the wrong crowd and paid the price – three years in prison and he lost the one person who had ever meant anything to him – Scott. Adam has done his best, tried to turn his life around and is in the Bahamas looking for a second chance. Finding Scott was the easy part. Getting him to trust him again, could be harder than he ever imagined.